My friend "BC" pinged me with some interesting employment stats regarding the state of Oregon that apply in varying degrees to every state in the union, and arguably most countries in the world. OR total payroll employment has not grown in 11 years, which is not unlike most of the rest of the US. 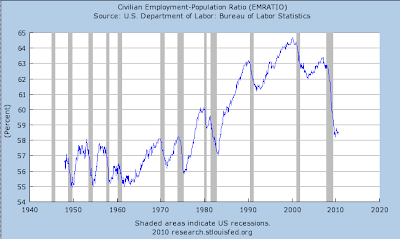 However, adjusting for OR population growth, payroll employment is back to the level of the early '90s. But it's worse than that. Private payrolls are back to the level of '97, and adjusting for population there are fewer private payroll jobs per capita than the late '80s to early '90s. And gov't payrolls over the past two decades have grown at twice the population/labor force growth rate. Total OR employment is back to the levels of '04-'05 and '99-'00; however, adjusted for population/labor force growth, employment is down 10% from '00 and down 3.1% from '90. Now that local and state employment is necessarily being cut along with no growth or continuing contraction of private payrolls, and were OR gov't payrolls to converge with the differential rate of growth to private payrolls and population/labor force growth, OR gov't payrolls will be cut by 30-31% over the coming decade, implying further a similar cut in local and state budgets. Extrapolating further at the trend rate of population growth, the per-capita reduction in gov't payrolls and spending will be around 40%, matching what is likely to be the same decline per capita in oil production/consumption, bank lending (and overall value of US assets), and US GDP (and states' GSP) that otherwise would have occurred from the '00 peak rate had the long-term trend rate occurred. Needless to say, the consequences for such a decline in overall private and public economic (or uneconomic) activity will be severe, life-changing, and consciousness-altering. The above comments stem from an analysis of Bureau of Labor Statistics Oregon Economy at a Glance statistics. 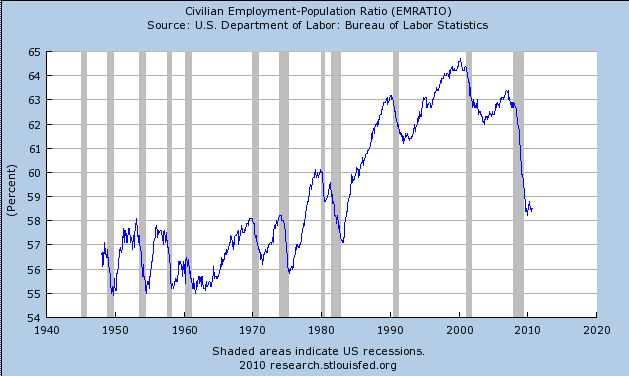 The following chart civilian employment-population ratio has declined to a point last seen in the early 1980's. That population group is now responsible for supporting not only their own personal debt obligations (much higher than at any point in history), but also the demands of public union benefits on top of social security and Medicare promises to retirees. This turn of events has been an enormous shock to the system yet most people have not recognized these demographic changes. Everyone is so used to upward progress that we have a very hard time imagining anything else. The public pension system is bankrupt at every level: city, county, state, and federal. We cannot afford the pension promises and benefits made to public union workers. I reported on one such example the other day. In case you missed it, please consider Chicago Pension Funds Selling Assets to Meet Obligations; Needs to Double Property Taxes; Current Liabilities of $41,966 per Household. Pension plans in general are at least $3 trillion in the hole. Changing demographics seal the fate. Few are prepared for the sacrifices that must be made to bring the system back into fiscal soundness. Unfortunately, Keynesian clowns think government can spend our way to prosperity. It cannot and will not happen. We need to reduce government spending, not increase it. The British government on Wednesday unveiled the country’s steepest public spending cuts in more than 60 years, reducing costs in government departments by an average of 19 percent, sharply curtailing welfare benefits, raising the retirement age to 66 by 2020 and eliminating hundreds of thousands of public sector jobs in an effort to bring down the bloated budget deficit. Britain has about six million public-sector jobs, about one fifth of all jobs in the economy, according to the Office for National Statistics. One quick look at the demographics in both the united states and the UK show the present path is not sustainable and the system is bankrupt. Yet noble prize winning economists like Paul Krugman and Joseph Stiglitz cannot seem to grasp the simple reality of the situation. Economist Joseph E. Stiglitz argued that the government’s plan was “a gamble with almost no potential upside” and that it would lead to lower growth, lower demand, lower tax revenues, a deterioration of skills among the unemployed and an even higher national debt. Every day I ask myself how allegedly brilliant economists cannot see that continuing down the current path will lead to a situation like we recently saw in Greece. It is impossible to spend one's way out of a mess then the problem is unsustainable spending. For more on "Brilliant Idiots" please see Keynesian Nonsense Falls Out of Favor in UK - Thank God! None of these Keynesian fools ever address the question as to what happens when the stimulus is cut off. None of them can see that Japan has proven in spades that neither Keynesian nor Monetarist solutions did anything for Japan but increase debt. My friend "BC" has it correct: "The consequences for such a decline in overall private and public economic (or uneconomic) activity will be severe, life-changing, and consciousness-altering. " However, the unfortunate reality of this economic mess is doing nothing or worse yet listening to Keynesian clowns will only make matters worse later. We have reaped the rewards of putting off the inevitable once too many times already. The Housing bubble and debt collapse is proof enough of what happens. Japan has proven that all you get from Keynesian and Monetarist spending is more debt. Japan has squandered decades of trade surpluses building bridges to nowhere. As soon as interest rates in Japan turn up Japan will be bankrupt. Yet "brilliant idiots" want to go back to the well "one more time" hoping the system will right itself by more spending even though it should be perfectly obvious that mathematically, demographically, and in actual historic practice, that more government spending cannot possibly work.